A customer of mine had a fine bakery wagon with curtains at the sides, but he thought that doors with a glass window would be better. He wanted me to make them so that he could open them from the inner or outer side. 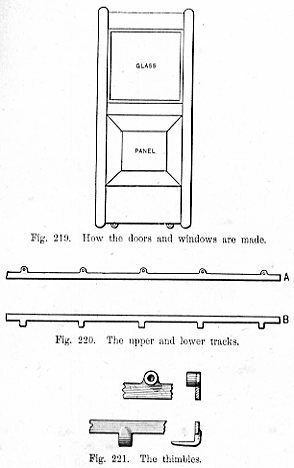 The doors were made of hickory, one and a quarter by three and a half, and the windows were at the top as shown in Fig. 219. B, Fig. 220, represents the lower track on which run the wheels. It was of iron and attached to the bottom of the bed. The dimensions were one by one-quarter inch by five feet eight inches, and there were five angle irons welded on it. A in Fig. 220 represents the upper track. It was one by a quarter inch by five feet eight inches, and had five loops welded on it so as to bring the bolt holes above the guides in the door at the top. The guides at the bottom also were run on each side of the lower track. The upper track was held out from the top by means of five thimbles five-eighths-inch long, as shown in Fig. 221. A quarter-inch bolt ran through the Mack and thimbles and into the lower rail of the top. The rub lock was on the outside, as indicated in Fig. 222, and I had to move it out of the way of the drawers B. I made a back-action rub lock, so that when the foot was put on the loop C that would move down. 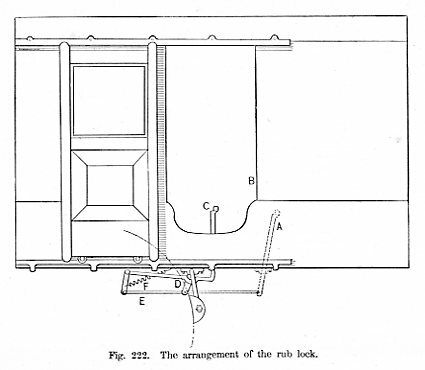 The loop ran under the block rod at D, and was attached to the bed back of it, and connected with it by the rod E, so that by bearing down at C, the rod was pulled back. The block on the wheels F, is a spring to throw the lock off the wheels. I think that this arrangement would be a good one for makers of bakery wagons to adopt. It is useful in cold weather, and allows the driver to get in and out quickly.� By Cr. W. P.